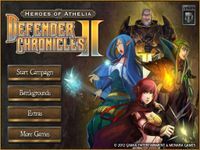 Defender Chronicles II: Heroes of Athelia is a vertical, 2D Tower Defense game with strong RPG elements. Each map consists of paths that wind from the top of the level to the bottom, with enemies entering at one end and trying to reach the other. The player may establish "guilds" at predetermined positions on the map, and these guilds will support up to five units of the same type in that position. Unit types include crossbowmen, archers, warriors, mages, and more. Strategy and story are driven by the game's for Heroes: Melwyn, Lovell, General, and Elwyn. Only one hero can be taken into battle at a time. The hero is much stronger than a guild, and can provide various bonuses to particular unit types (for instance, Melwyn boosts the effectiveness of mages). Heroes gain experience when a stage is completed, and may allocate skill-points after a level-up. The player also earns credits that may be used to purchase equipment , which is a crucial part of the game design. Heroes may equip several accessories at a time, and loot has complex properties like many RPGs (Diablo etc). At the time of writing, Defender Chronicles II is not "free to play," but it does rely heavily on in-app purchases to generate revenue. Such purchases can permanently boost end-of-level experience and money, alter the rare-item drop rate, and so on. The developer for DCII maintains a web community for the game that can be accessed directly from the app itself.